What do I need to know before booking? The Form Says "Starting at Rp. 550.000". Why is the total Rp. 1.800.000 after adding transport from Kuta and Hot Spring Tickets? 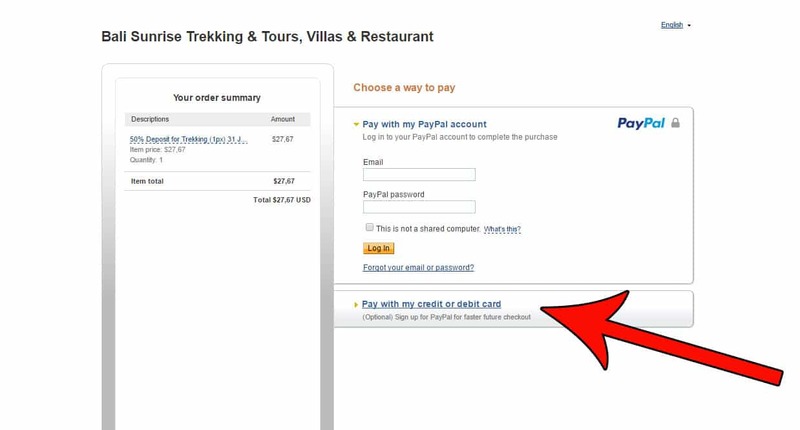 For on-line bookings you will receive an automatic confirmation immediately, if you pay deposit by PayPal or credit card (PayPal guest checkout). If you have any additional questions or concerns, or just want to touch base with our office personally before your trip, please feel free to send us a follow up message. Your booking will NOT be confirmed until deposit has been received, unless you arrange specially with Gede to waive your advance deposit. We collect a 50% deposit in advance, either on-line or by bank transfer. The remaining 50% can be paid in cash on pick-up. There is a significant amount of planning and staffing involved with each trek and tour, and we must prepare our drivers, guides, and supplies in advance. So we need to know ahead of time exactly how many people will be joining us. The funds that we collect by deposit are used in that preparation. While we would really love to be able to accommodate people who have difficulty paying deposit on-line, we have suffered significant losses where we have arranged drivers, guides, and meals only to have guests not show up, or cancel at the last minute. We do hope you understand our position on this. You can review our cancellation policy Here. Last minute booking exception: If you are booking for pick-up tonight, and cannot pay on-line, you can authorize our driver to collect a 50% cancellation fee from your hotel reception in case you are not there at pick-up time. This is a last resort, and only for bookings within 24 hours. If we are not able to confirm that you have checked in at your hotel, or suspect we may have trouble collecting, your booking will be rejected. If you are not already checked in, or are staying at a villa without reception, you must contact us to make special arrangements. Unfortunately, we can make no guarantees regarding weather, and must put in our time and expense to prepare for every trip. Opting out of your tour due to weather is still subject to our cancellation policy. Many people do choose to start their trek in the rain, as it may clear up by sunrise. If you are concerned about the weather on the day of your tour, please opt out before being picked up, and forfeit your 50% deposit. After pick-up your driver will collect the remaining amount due, and your tour is 100% non-refundable! If we cancel your tour due to weather, we will refund your deposit. • 1-3 days before your booking (24 to 72 hours prior to pick-up) – 50% (half) refund of your deposit. Safety is our main priority, so we suggest you wear strong hiking boots or sports shoes when going up the mountain. We also suggest that trekkers wear comfortable clothes and bring a sweater, thin coat or raincoat, as it can get cold at the top of the mountain and it may rain even in the dry season. We provide drinking water, flashlights, and a light breakfast at the top of the mountain. Of course you are welcome to bring your own provisions and supplies as well. If you do plan to bring your own supplies, we suggest a small, lightweight backpack that won’t weigh you down on the trek. How fit do I have to be for a sunrise trek? Our Mount Batur sunrise trek is our most popular trek because it is easy to join and accessible to a wide variety of people. A basic level of fitness and mobility is all that is required for this trek. Our Mount Agung sunrise trek is our hardest and most challenging trek. Trekking experience is an essential requirement, and trekkers should be in good physical condition. What is the difference between the Mount Batur Sunrise Trek and the Batur Caldera Sunrise Trek? Good question! The Mount Batur Sunrise Trek takes you up the side of the volcanic cone of Mount Batur and to the top of the peak, which is 1,717 metres above sea level. The entire trek takes about 2.5 hours, and along the way you will pass craters and lava flows. From the top you can see the crater lake, and the neighbouring Mount Agung and Mount Abang. The Batur Caldera Sunrise Trek takes you up the caldera wall, which is a ridge that rises above the crater lake opposite the volcanic cone. This trek only takes about 45 minutes to an hour, so it is a bit more easy-going than the Mount Batur Sunrise Trek. From the top you can see the volcanic cone of Mount Batur, Mount Agung and the coastlines of Bali and Lombok. Local ordinance requires one guide for every four passengers, so passengers are divided into groups of four. If you would like to book a group of more than four people, you will be provided one guide for every four. We recommend booking a private trek (a 50% surcharge applies) if you think you will need extra assistance or if you think you might slow down the group. A private trek will also ensure you get your own personal tour guide throughout the trek. I’ve heard Mount Agung is Bali’s most sacred mountain. Are there any dos and don’ts I should know about? The Balinese have no problem with visitors climbing Mount Agung. However, like anywhere in Bali (or Indonesia for that matter), you should respect the local culture and environment. This means dressing appropriately in modest clothing, taking all your rubbish with you when you leave, and being mindful of temples, shrines and family homes. If you have any questions about the local customs and/or sacred spaces, your guide will be happy to answer them. Can I get picked up from one location and dropped off in another? Yes, that is possible, but keep in mind that we have different rates for different locations. If your drop-off point is in a high traffic area (Kuta, Sanur, Ubud) then you can just use the on-line booking. You must book from the furthest location. So, if you would like to be picked up in Padang Bai, but dropped off in Ubud, please select Padang Bai when booking, and add the drop off information in the message/special instruction. If your drop-off location is out of high traffic areas we will need to arrange an additional driver and car hire charges will apply. Not all pick-up locations are available for single passengers, and the 2px minimum rates may apply. Please contact us in advance for pricing. How accurate are the pick-up and drop-off times? Should I book a trek before my flight? We do our best to run things as smoothly as possible, and we do offer approximate pick up and drop off times. On pick-up we hope that we will be allowed a reasonable amount of time on either side for normal fluctuations in traffic, weather, and other minor delays. Of course, if you are waiting at the prearranged pick up point, and we fail to pick you up for any reason, you are entitled to a full refund. With drop-off, times can be even harder to predict. Not every group takes the same amount of time to complete their itinerary, and we have to organize several points with our drivers. We can only offer approximations, we can’t make guarantees. Please do not make important plans based on approximate drop off times. We do not accept any financial responsibility for losses based scheduling conflicts or unexpected delays.